Location, Date: Saturday April 27th, 2019 from 9 a.m. - 2 p.m.
Park at Lakeside Church on Conservation Road, Guelph. A shuttle will take you to the site! Shovels provided! Rain or shine! Come for one hour, or stay for five! We are calling on environmentally-minded citizens to help transform a 40-hectare area, across from the Guelph Lake Nature Centre, into a wonderful new resource for our community, with trees that will clean our air and link nearby forest habitat to create a corridor for wildlife. This vision of a healthy community for generations to come is celebrating its 12th year. Wear your boots and learn how to plant a tree while having fun with your neighbours, family and friends. Shovels provided! We look forward to seeing you there! Free shuttle bus from downtown Guelph Central Station, platform 15 will leave every hour on the hour starting at 9am to 1pm with a stop at the corner of Woodlawn and Victoria Roads at 15 minutes past the hour. Refreshments and food available for purchase. Drinking water available. Please bring your own container. Check out the displays from the Biobus, Wild Ontario with their birds of prey and musical entertainment by Terry Van Dreumel. -To celebrate our 100 years of service, the Rotary Club of Guelph in partnership with the Rotary Charitable Foundation, the GRCA and the GRCF, are turning the Rotary Forest into an exciting hub for the entire community to embrace active living, a healthy environment, family time and education. - The Rotary Club of Guelph and the Rotary Foundation have donated $250,000 toward the GRCF’s wonderful new Nature Centre. The Centre will have modern learning spaces for the 20,000+ young people who will benefit each year from hands-on programs and will be a gathering place for park visitors to take part in nature programs and access information. - An observatory will be built at Guelph Lake. An ideal location for star-gazing where everyone can broaden their minds and be inspired by the wonder of the universe. The observatory will have a retractable roof containing 3 powerful telescopes. -An inflatable planetarium will be part of the new Nature Centre - a fantastic and awe-inspiring education tool for all ages. - A fully accessible trail will be built within the Rotary Forest to support a range of activities all year round and will connect the Rotary Forest with the future Nature Centre and observatory within the park. -Fundraising initiatives for these wonderful projects are still ongoing by the Rotary Club of Guelph and the Grand River Conservation Foundation. Donations welcome! We are pleased to announce that the Rotary Club of Guelph will once again be partnering with the Grand River Conservation Authority and the Grand River Conservation Foundation on April 27th for the Rotary Forest tree planting event. This is a wonderful opportunity for our community to get together and make a significant difference. The Rotary Forest project’s ultimate goal is to increase the canopy cover in the City of Guelph and surrounding area by planting 60,000 trees by 2020 and create an exciting hub for the community. Each year we plant a wide variety of trees with a special grove or area. Location, Date: – Saturday April 27th, 2019 from 9 a.m. - 2 p.m.
A shuttle will take you to the site! The Rotary Forest project began in 2007, thanks to the vision of a team of Rotarians from the Rotary Club of Guelph in partnership with a team from the GRCA. The project's ultimate goal is to increase the canopy cover in the City of Guelph and surrounding area by planting 60,000 trees by 2020 and create an exciting hub for the community. Each year, we call on hundreds of environmentally-minded citizens to help us transform a 40-hectare area, across from the Guelph Lake Nature Centre, into a wonderful new resource for our community, with trees that will clean our air and link nearby forest habitat to create a corridor for wildlife. This vision of a healthy community for generations to come is celebrating its 12th year in 2019. Each year we plant a wide variety of trees with a special grove or area. One year we planted a white pine grove, another a walnut grove, for Canada's sesquicentennial we even planted a sugar maple grove in the shape of a giant maple leaf! Last year we created a beautiful wildflower meadow for pollinators as well as planted trees and shrubs. We plant evergreens as well as a variety of deciduous trees each year like oaks, maples, and hickories as well as shrub species like chokeberry, ninebark and serviceberry which increase diversity and provide additional food sources for birds and wildlife. This incredible project has been recognized by Rotary International as an exceptional community project. 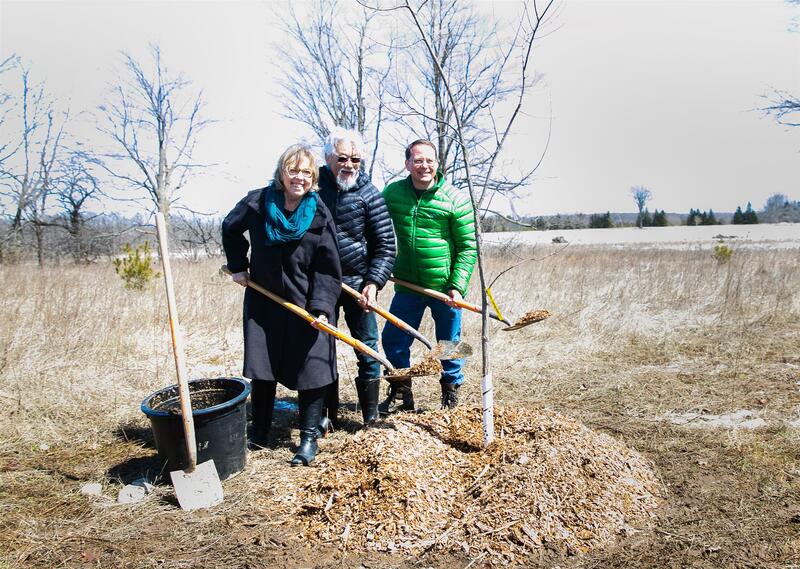 We were honoured to have Elizabeth May, Mike Schreiner and David Suzuki join us last year to plant a special Elm tree grown by the University of Guelph.